In 2010 I was a reasonable newbie in the museum business. In fact, when I was hired as the Director of the C.H. Nash Museum at Chucalissa in 2007 I had never formally worked in a museum. Instead I had operated on the periphery of museums in my career as an archaeologist and academic. The 2010 AASLH meeting proved an ideal venue to get my feet wet in learning about available resources, best practices, and networking with other museum professionals. Over the past 30 years I have attended many professional meetings ranging from city-wide to international in scope. While not dismissing the importance of any association, as a small museum professional, I find that AASLH conference is a perfect fit for my needs. Conferences such as the American Alliance of Museums (AAM), while certainly of value, tend to focus on the needs of the medium to large museums. City and state conferences, while wonderful networking and experience sharing opportunities, cannot marshal the resources of a national organization like the AASLH. Although sessions often cover the same topics as both larger and smaller professional meetings, the AASLH application is more inclusive of small museum contexts. Of critical importance is understanding that the AASLH application is not lesser than, but rather more inclusive and relevant to my needs as a small museum professional. 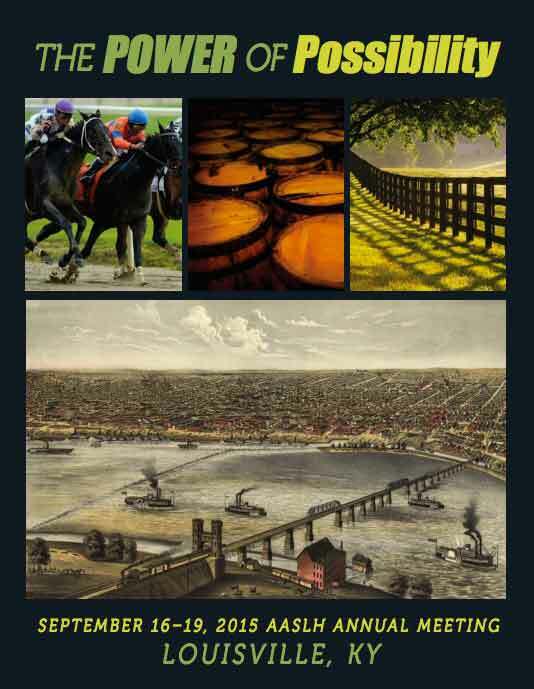 The program for the Louisville meeting is particularly relevant to my interests. I am particularly looking forward to hearing Wendell Berry one of my favorite writers/philosophers speak. Check out the preliminary program to see what sessions might suit your interests and needs. In a quick review of the program, sessions such as Kids Count, Too! Writing History through Community Collaboration; The Courage to Co-Create: Practicing Engagement with Your Audience; Marketing Educational Programming in Tough Times; and The Power of Possibility: Developing Partnerships through Project-Based Learning immediately caught my attention. I am pleased that multiple “pop-up” sessions will take place at this year’s conference to provide more spontaneous discussions on a range of issues. I am intrigued by the theme of this year’s conference – The Power of Possibility. In a time when many cultural institutions are just now recovering from the recent economic downturns, focusing on what is possible in our new realities is an exciting step in the right direction. If you have not been to an AASLH conference before, I encourage you to check out the event. If you have attended in the past, the program for this year’s meeting looks fantastic. Hope to see you there!